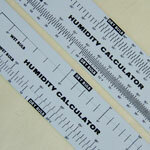 The 225-569 Pocket Psychrometric Slide Rule quickly converts wet-bulb and dry-bulb temperatures to relative humidity. The user simply lines up the two temperatures and reads relative humidity directly. 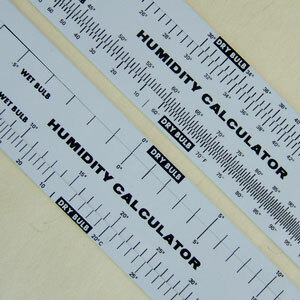 The 225-569 Pocket Psychrometric Slide Rule quickly converts wet-bulb and dry-bulb temperatures to relative humidity. The user simply lines up the two temperatures and reads relative humidity directly. The RH scale ranges from 10% to 100% with graduations of 2%. Values to 1% RH may be estimated. Two models are available. The 225-569F Slide Rule has a temperature scale of 20° to 100°F, and the 225-569C has a scale of -5° to 50°C. Both are small, lightweight, and durable.